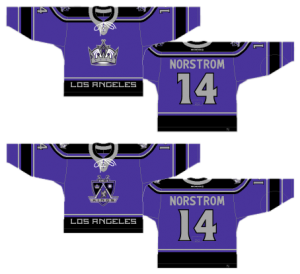 This installment of the Worst to First Jerseys features the Los Angeles Kings, and part of this series is hosting posts on a blog of the team that’s being featured. This post was originally featured on the blog The Royal Half, which can be found by clicking here. And much thanks to The Royal Half for letting me guest-post. I haven’t always been very kind to Los Angeles on my blog, ranking their logo as the 3rd worst in the league (and it would probably rank as 2nd worst now that Anaheim has fixed their problems and their alternate logo is now their primary one). 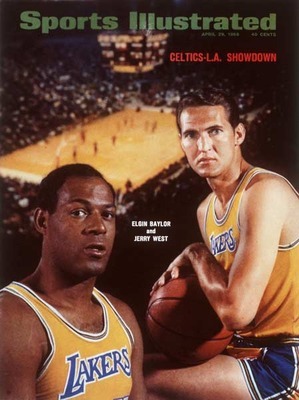 But some of their jerseys are pretty iconic, being the only team ever in the league to rock both a black-grey-white branding and a purple-gold branding (and a black-grey-purple branding too). Having unique colours is a good starting point for jersey design, but there has to be an excellence of execution as well. The LA Kings made arguably the greatest player to ever play the game of hockey wear this jersey. That itself is almost sacrilege. In 1995, the NHL introduced a third jersey program for the first time. The first teams to participate were the Mighty Ducks of Anaheim, the Boston Bruins, the Pittsburgh Penguins, the Vancouver Canucks and the LA Kings, who produced this jersey. To be fair to the Kings, none of the teams came out with anything good. For Anaheim, Boston and Vancouver, it was the worst jerseys they’ve ever worn. Pittsburgh’s was mildly acceptable. So the bar was not exactly set very high at the beginning. These jerseys remind me of the futuristic jersey debacle that the MLB came out with in the late-’90s. 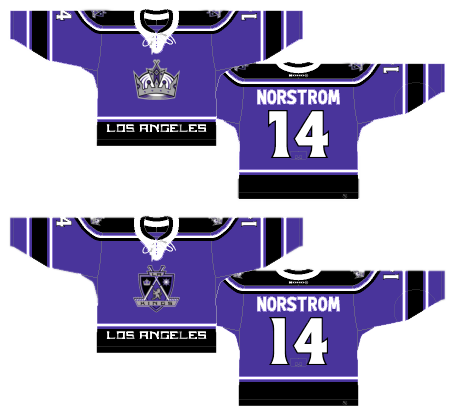 And who knows, maybe in about 75 years from now all hockey jerseys will look like this Kings’ one and we’ll praise its wonderful design. Today’s hockey jerseys, after all, certainly look nothing like they did about 75 years ago. But that’s the thing about design: any developments are usually incremental and inch forward slowly. We all stand on the shoulders of our predecessors to move things forward. Too big of a jump and it will get ridiculed, or if it’s lucky, will be looked back on in a few years as being “ahead of its time”. Do I think that will happen with this jersey? HA! Hell no. For one, the colour palette is all messed up. It seems a moment of indecision on whether to keep their current colour scheme (black, white, grey) or bring back their previous one (yellow, purple) caused them to keep both, and it just becomes muddled, not in the delicious mojito way though. It becomes more of an eyesore when you mix bright-and-colourful on something otherwise monochromatic. You gotta pick one or the other. The fonts used are equally horrible. Serifed fonts are generally an awful idea for sports jerseys of any kind, as they have finer details to them that make quick reading more difficult than sans serif fonts. Then, when you outline it twice (!) and slap it on grey, it becomes next to impossible to read. And then they decided to make the italic, making it even more difficult to read. Brilliant. As for the swooping greyed-gradient lines, it’s a unique take on the traditional striping on the sleeves and bottom of hockey jerseys, but it’s just too much of a leap from tradition to be considered a smart decision to make. It certainly made for an interesting placement of the logo on the front, but I’ve always considered the greatest part of hockey jersey design to be the prominence of the logo crest: something that non of the other major sports do on their jerseys. Relegating it to more of a soccer-style patch detracts from the jersey overall, leaving you just some stupid swoopy lines to focus on. Speaking of logos…hoo boy. The article I mentioned above goes more into the process behind the logo design, and definitely makes for an interesting read, but whenever you introduce human (or human-like) forms into a logo design, you’re wandering into minor-league design aesthetics and you have to tread very carefully. Only Chicago, Ottawa and you could argue Pittsburgh use it in the NHL, with varying degrees of success. I’ve seen worse than this one, but the Burger King references are not undeserved. There’s so much going wrong with this jersey, it’s impossible to not place it anywhere other than last. Jersey Recommendation: #14 Shuchuk. Who? Exactly. Forgotten, like these jerseys should be. 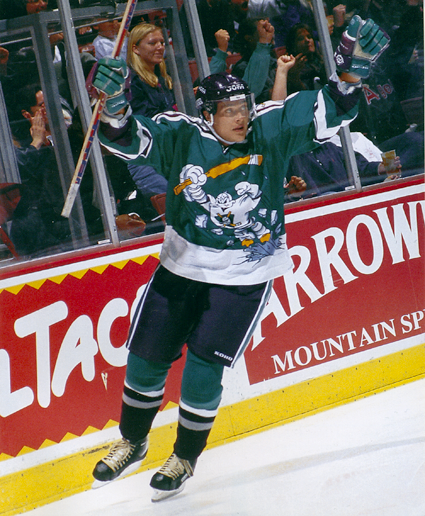 Also, 1995-96 was his last year in the NHL, and thankfully for these jerseys as well. Collect it for posterity’s sake. Regardless of which logo is on the front (in 2002, the Kings switched their alternate logo to their primary, and vice versa), this jersey isn’t very good. There’s two major reasons for that: No white and the Los Angeles text. First, the white issue. The only white on this jersey is a little bit on the logo and the laces. This may not seem like too big of a deal, but in the NHL today, only three teams have a jersey (home, away or third) with this amount of white. Both Minnesota (homes and thirds) and Ottawa (thirds) are going for a specific retro look and use cream instead. Phoenix (thirds) have sand as one of their official colours and use that, and its the worst jersey they currently wear. So what am I getting at? 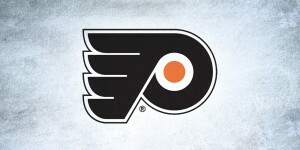 White, or negative space, is one of the most important parts in any design: jersey, logo or otherwise. What happens when it doesn’t exist is that the design feels weighed down. And that’s exactly how these third jerseys look: heavy, claustrophobic and overly busy. Switching out all the grey for white helps, but there’s a balance that can be found between the grey and white as well. The second thing, the “Los Angeles” text along the bottom of the jerseys is just stupid. It’s an interesting experimentation (which is what third jerseys are for), but it adds nothing to the overall design of the jersey and, especially when combined with the lack of white, just reinforces the heaviness of the design. There have been extremely few hockey jerseys with text along the bottom of the jerseys – the most (in)famous being the Czech Republic’s Olympic jerseys from a decade or so ago. What the text also does is create a visual void on the back of the jerseys since the design doesn’t carry over to the back. Whatever the reasoning was to leave the text off the back of the jersey (too busy? too distracting? didn’t look right? too much text?) could just as easily be applied to the front. Get rid of it and it’s looking better! Some minor issues are inconsistent stripes between the sleeves, the shoulder yokes and along the bottom, making the design look incoherent. The shield logo that the Kings used is too complex for a logo in general and just accentuates the other issues I’ve already talked about. What I do actually like is the use of purple, or rather, something other than black. Hockey is a game played on a bright clean canvas of white ice. Having the team wearing white playing a team wearing black is about as visually boring as it gets. Throwing some colour in there makes things a little more interesting. Do I like the colour purple for a hockey jersey? Not particularly, but it’s something different and, as previously mentioned, third jerseys are good excuses to play around with these sorts of things. Jersey Recommendation: #33 Palffy. 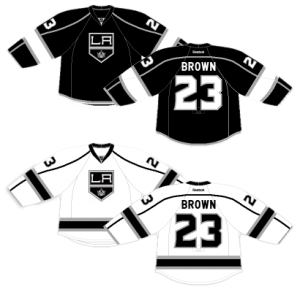 The Ziggy One’s best years were with the Kings and they used these jerseys during his entire tenure with the team. Get it with the shield logo on there. If you’re going to buy a bad jersey, may as well go all out. 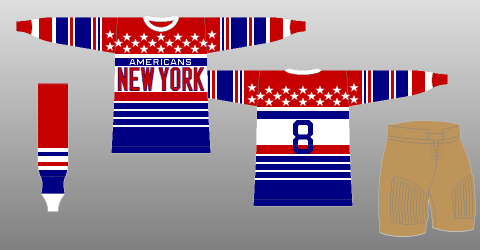 The 2002 switcheroo of the alternate and primary logos affected these jerseys as well. For the record (if you’re wanting to quote me for some reason on this), I prefer the crown jersey rather than the shield. It’s less complex, stand out more on the jersey and is probably the best logo the Kings have had (which is quite sad to be honest). These jerseys are very similar to the third jerseys that were just talked about above, these jerseys come in a position above for a few minor reasons. The biggest thing is the striping is more consistent between the shoulder yokes, the sleeves and the bottom of the jerseys, and more minimalist than the third jerseys as well. But the other issues are still here: the “Los Angeles” along the bottom and the lack of white on the black jerseys. When the 2007 Reebok Edge jerseys are introduce, the team made the strange decision of eliminating the stripes along the bottom altogether and left just the text. It’s a bit more minimalist, but it’s getting rid of the wrong element. Then, they curved the text to fit the contours of the jersey, which is an even worse decision, as it makes the text look even more awkward and out-of-place. Jersey Recommendation: #17 Visnovksy. This wasn’t the greatest era for Kings, missing the playoffs more often than not. It was a time when some of the past greats were slowing down and the future stars weren’t rising yet. 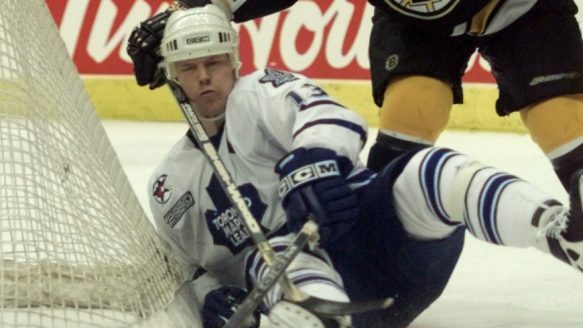 But Visnovsky was a great defenceman for the team, and he had his best years with the Kings. Go for the CCM-era home whites, with the crown logo. The remaining four jerseys are, in my mind, neck-and-neck. Each has their drawbacks and pluses and ranking them was a difficult task. I could be swayed to put any of them in first place and any of them in fourth place. But, there has to be some order here, so I went with the second iteration of the purple and gold as the worst of the best. 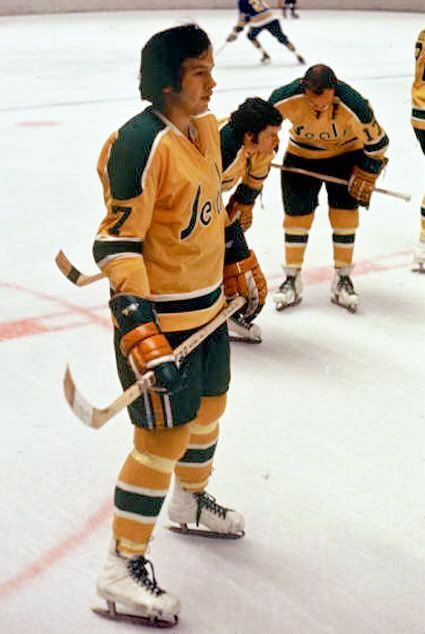 Why this jersey should be ranked 4th: The cuff-to-cuff shoulder yoke is a look that sometimes works, and there are a few teams that still use them with relatively good success today (see: Philadelphia), but they remind me of the ’80s when teams like the Leafs and Jets donned similar looks. 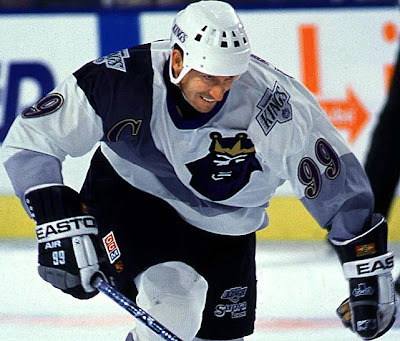 In that sense, these Kings jerseys are good for their time, but man, do they look dated now. The other problem with having the big yokes like that is due to the colour scheme. Purple and yellow are complimentary colours and generally work really well together (see: LA Lakers). But it works less when they are given equal billing and start competing with each other. It becomes unbearable and obnoxious, like two great musicians trying to play over each other (see: David Bowie and Bing Crosby) instead of complimenting each other (see: David Bowie and Freddie Mercury). These jersey are definitely heading in that obnoxious and over-bearing direction. Why this jersey should be ranked 1st: The inclusion of a simple white stripe, breaking up with yellow and purple, actually helps balance some of the problems I was just talking about, so there is some breathing space from the onslaught of colour. Also, the stripe patterns are consistent, simple and work well to balance the loudness of the colours. And really, there’s just not enough purple and gold in the world of hockey. 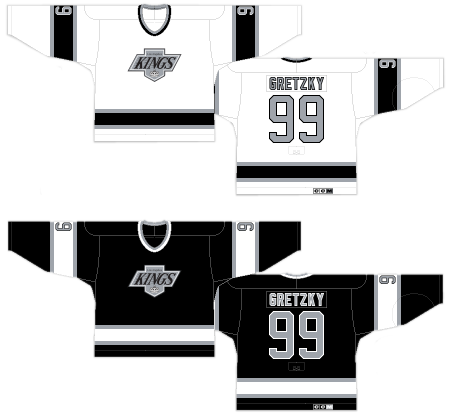 Compared to the black-and-white colour scheme that the Kings adopted after this era, these jerseys were distinctive and unique in hockey design and still would be today. And they add so much colour to the clean sheet of white ice. I hope we see some rendition of these jerseys for the Stadium Series game, but please not all chromed-up like the logos. Jersey Recommendation: #9 Nicholls. He was the Kings’ most prominent scorer during this era and one of the only stars to be on the team during the entire decade they wore the jerseys. Get it in the home golds. The Kings’ current jerseys are also in the mix of being considered one of the best jerseys the team has worn, but like the others, there’s some good and some bad mixed in. Why this jersey should be ranked 4th: Black and white. Like I’ve mentioned a couple times, with a blank canvas like a sheet of white ice, having some colour on there is part of what makes the game great. And there’s absolutely no colour on these at all. Every home game, the Kings’ fans are looking at black jerseys playing against white jerseys. Yeehaw. No colours at all. If the NHL went back to having home whites and dark roads, it wouldn’t be as much of a problem. But they don’t. So it is. 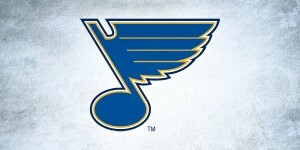 Also, that logo is something awful. 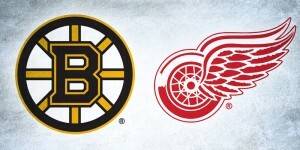 There’s plenty of reasons why it got ranked at #28 in the BTLNHL (Best Team Logos in the NHL) Countdown, which I discuss in the post. But mainly, it symbolizes the worst possible design to combine the Kings’ heritage into something new. But, it’s minor because this post is about the jerseys, not the logos specifically. Another point, the shoulder yokes, or the outline of them, only half work (the back half). I think they look great on the back of the jerseys, but the curve on the front of the jerseys, to bring them to the collar, is strange and don’t fit with the rest of the jersey. Why this jersey should be ranked 1st: For using on black, grey and white, it works really well. The lines are strong and clean (aside from the front of the shoulder yokes). The striping pattern is minimal and consistent (although I don’t think they need the thin grey stripes at the end of the cuffs) and I like the decision to leave the stripes off the bottom of the home blacks. It obviously doesn’t need them while, at the same time, it works really well for the road whites, keeping them from appearing too much like practice jerseys. Also, the font they’re using for the numbers blends the traditional blocked-off corners of hockey jerseys with a new font that matches the font of their logo. It’s a nice piece of subtle branding and consistency and, as much as I’m not crazy about that font on the logo, it works well for the numbers. It’s a really nice mixture of traditional and contemporary hockey jersey design, looking classic and modern at the same time. Jersey Recommendation: #32 Quick. He’s probably the main reason the Kings destroyed all of their competition on the way to their first Stanley Cup and, given his contract, he’ll most likely be a King for life. 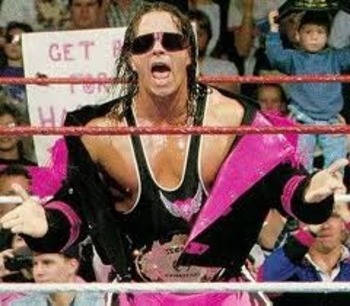 He’s as much a symbol of this era as Brown, Kopitar or Carter. Get it in the black. Los Angeles was part of the very first NHL expansion in 1967, along with 5 other cities (Minnesota, Oakland, Philadelphia, Pittsburgh and St. Louis). The Kings were the only team in the league to not have home whites, opting instead for home golds, to match their NBA cousins (who had the same owner). 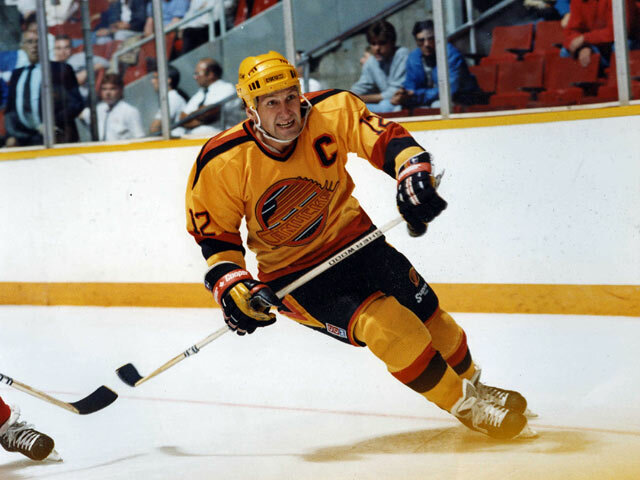 Since then, only the California Golden Seals (1970–74), Canucks (1978–89) and Penguins (1983-84) have not worn a white jersey in a season. Based on what I’ve been saying about the detriment of black and white jerseys, it’s pretty great to ensure that more colour is being shown on the ice and it’s great to watch when they periodically wear these jerseys today. Why this jersey should be ranked 4th: The lack of white in this jersey makes the purple and gold a little bit too intense overall. The lone spot where is this a pretty good amount of gold is in the logo itself. That’s not necessarily a bad thing as it draws the eye right to the logo automatically, but it needs a bit more in there. 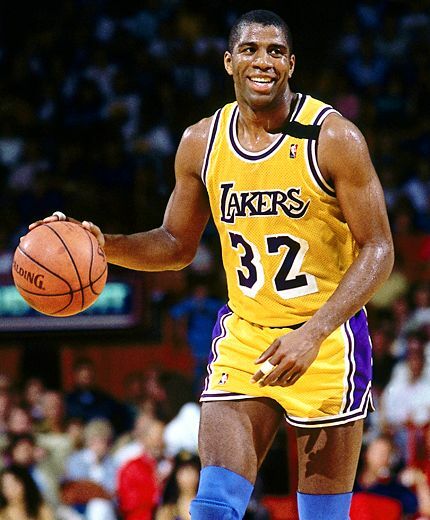 For example, if the stripe on the sleeve and bottom of the jersey had an extra white stripe (like on the 1980–88 jerseys), that would help out this jersey a lot. For some reason, the font they used for the nameplates are extremely condensed, slab-serifed and much harder to read than they need to be, especially when it’s yellow text outlined in white, as on the purple jerseys. And the logo looks awful on the purple jersey – a complete visual mess with the yellow background instead of the purple. 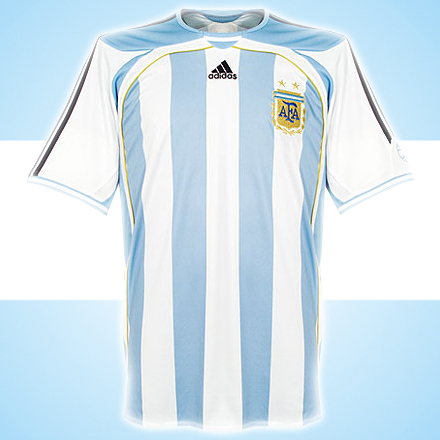 Why this jersey should be ranked 1st: The simplicity of it is actually pretty gorgeous. Purple with a solid gold stripe on the sleeves, collar and bottom. Vice versa on the gold jersey. Simple, effective and – because of the intensity of the colours – it doesn’t need anything else – anything more would be detrimental (except maybe some white, as mentioned earlier). And the colours are distinctive in the NHL, with no other team ever having this colour scheme and it’s unlikely any other team will for a long time (if ever). The simplicity of it really works in another way: there’s not too much of one colour to compete with the other. 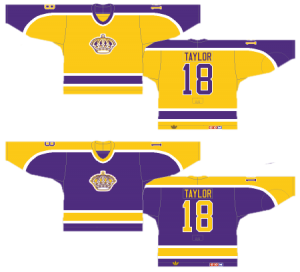 I mentioned earlier about complimentary colours needing one colour to be the obvious dominant one to really work together well, and this jersey does that well, or at least better than the other purple-and-gold jerseys I discussed earlier. 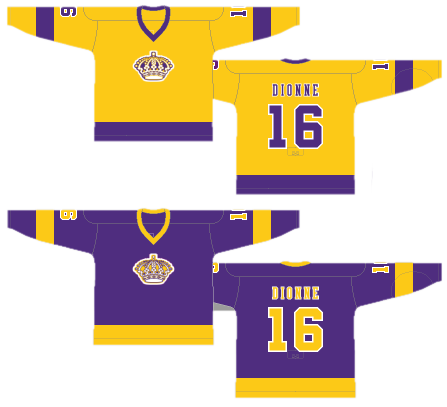 Jersey Recommendation: #16 Dionne. The first superstar the Kings had on their team, and the best player to wear the original version of this jersey. Get it in the home golds. This jersey symbolizes the first time the Kings were ever a dominant team in the league and had the greatest player in the game on their roster when he was still playing in his prime (unlike with the Blues or the Rangers). 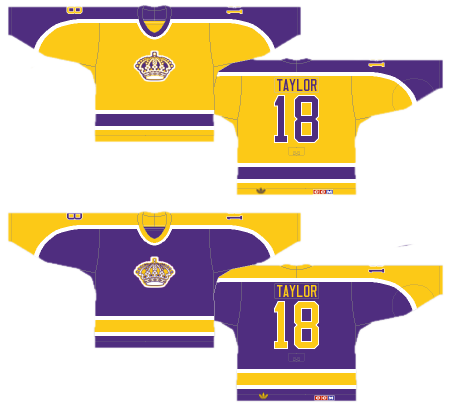 It’s also the first jersey for the Kings that steered them away from the Lakers’ colours and went to the Raiders’ colours (who played in LA at the time). 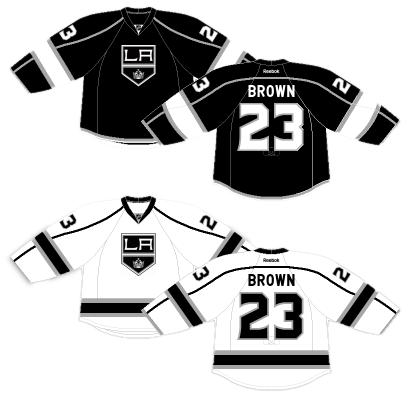 And it’s the best jersey the Kings have ever worn, but again, I could be swayed against that decision pretty easily. Why this jersey should be ranked 4th: Again, it’s the black and white. I appreciate wanting to continue that tradition of having colours that were similar to another professional sports team, but black and white jerseys look great on a green field, not on a sheet of white ice. It bothers me less than their current jerseys since, back then, the home jerseys were white and the road jerseys were black. LA fans got the white jerseys with the mix of coloured jersey visiting the arena. Everybody else got the (relatively) novelty of seeing an all-black jersey (back then, only Boston, Pittsburgh and Vancouver had black jerseys). Also, the logo isn’t really great. Italic Times New Roman doesn’t exactly instill a sense of uniqueness when you can type it by default in your Word program. The streaming lines emerging from the letters are also pretty cliché (“We’re going fast!! Get it?! We’re going REALLY fast!!”). And then there’s the home plate. Sorry, it’s just not a great logo. Why this jersey should be ranked 1st: Legacy. Success is a powerful tool in making people gloss over any design flaws. Would everyone love the Canadiens’ logo if it hadn’t been word while lifting the Cup 24 times? Maybe, but probably not. 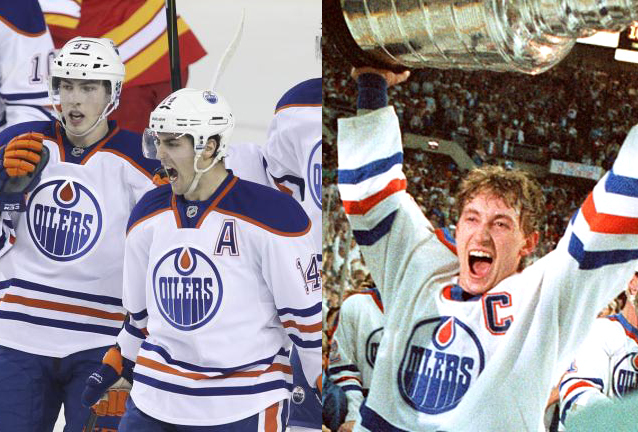 What about the Oilers? Everybody loves the fact they brought back the original colours in the last couple years because it harkens back to a better time. 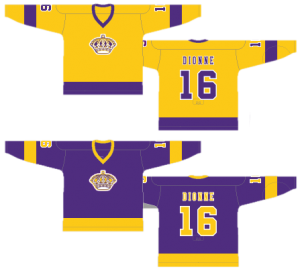 True, the Kings never won the Cup wearing these jerseys, but again, it was the first time in the team’s history that they were truly a Cup contender and a dominant force in the league after years and years of relative mediocrity. And some of the most historical moments for the entire league came with Gretzky wearing this jersey. It’s a celebrated jersey. But there’s other reasons too. The striping on the jersey is simple, strong and consistent. It’s nothing very exciting or ground-breaking, but that’s a good thing when using a colour palette like black, grey and white. It’s been selected to be unique and intimidating, so the jersey design played to that well. No patches, no extra swooping lines, no bad fonts on the nameplates, just a solid and intimidating jersey. And the best one the Kings have ever worn. Jersey Recommendation: #20 Robitaille. 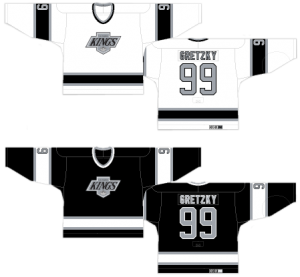 Sure, Gretzky’s the obvious choice for this jersey, but he’s not the quintessential LA King, having had more success with the Oilers before leaving for other cities. 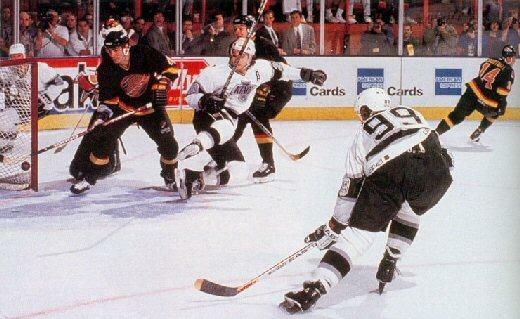 Luc Robitaille however bleeds black and grey, and purple and gold, and black/grey/purple. In fact, he’s worn 5 of the 7 jerseys on this list. He may not be the best player to ever wear a Kings jersey, but he is more a part of the franchise than anyone else so far and these were his prime years. Get it in the road blacks. Agree with the jersey rankings? Disagree? What Kings jersey do you own? Let us know in the comments below.